Shot without distraction or decoration, it is critical that “Rosetta” shows only the truth because its aim is to show a stark portrait of poverty. Its style is so bare, so skeletal and realistic that a handheld shooting style is employed in order for viewers to be placed right in the action as a desperate teenage girl, having just been let go from a temporary position without warning, hunts for a new job. Rosetta is played by Émilie Dequenne and she dominates every frame and devastating moment in the film—an astounding achievement because not only is it her first starring role, it is her first role ever on film. Writer-directors Jean-Pierre and Luc Dardenne are masters of showing rather than telling. Instead of relying on dialogue as a tool to explain or acknowledge the hardships of Rosetta’s life, the camera simply follows her day-to-day activities, the frame in focus from the waist up, often shot from behind. We observe the state of her trailer home. The interiors are drained of color and excitement. We notice her alcoholic mother (Anne Yernaux), panic-stricken at the sight of her daughter coming home because she knows that Rosetta is like a bloodhound, always searching for evidence that mother has been drinking yet again. Lesser filmmakers would likely have made the parent a target of ridicule, someone to judge and blame. 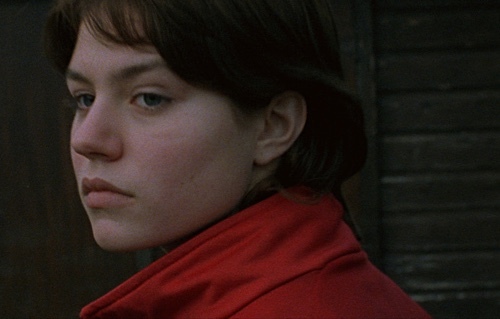 Instead, the Dardenne brothers, so focused in their objective of showing a specific lifestyle of a specific life, use the matriarch as a figure of Rosetta’s possible future. Rosetta regards her mother not necessarily with love or pity but a wilting thing that needs to be cared for because she is helpless. She fears she will become her mother if she fails to get “a real job” and live “a normal life.” The dialogue is scant but when utilized, we are made to remember what is expressed and how. We note Rosetta is always drinking tap water. She rarely eats because there is nothing to eat. But she must quench the hunger somehow. She is prone to abdominal pains so crippling, it is one of the rare moments when we see her react intensely. Despite her discomfort and exhaustion—in body, mind, and spirit—someone in their two-person household must land a job so bills can be paid. The campground manager (Bernard Marbaix) shuts things off without warning when payments are late. And so off Rosetta goes to ask around if anyone is looking to hire. Many of those she encounters never bother to look her in the eye. But looks or judgment, or lack thereof, do not defeat her. She is used to it, inured by people’s apathy. And when a rare person comes along who appears to genuinely care for her, who likes her in all of her simplicity, this individual (Fabrizio Rongione) is tested. Why should they care for trash like her? We look in Rosetta’s eyes and realize that perhaps trash is exactly how she sees herself sometimes. Still, she remains to have the will to fight, refusing to accept welfare or handouts. She’d rather sell clothes off her back. Notice how “Rosetta” does not employ soundtrack or score. Nor does it need to. Its music can be heard all around, from the way people move, like during a scuffle with security guards because someone would not leave the premises when asked, and how they feel when they are struck with a discovery, such as coming across one’s unconscious mother exposed outdoors for all the neighbors to see or a when a friend offers a helping hand. The music is ingrained in the every day happenings for the viewers to absorb raw, unfiltered.